Fingal County Council has submitted the Skerries Age Friendly Town Initiative into Cooperation Ireland’s ‘Pride of Place’ competition. The judging takes place on Thursday 21st July from 10 am until 12.30. After we give them a presentation of our full programme initiative we will bring them to various places in the town to show what has been done. We will have nice Music in Floraville during the morning. This music will be provided a local group and some of the Restaurants will provide some finger food. Come along and enjoy the morning. There will also be a fitness instructor from Fingal County Council at the exercise machines on the beach displaying how to make the best use of them. We cannot guarantee the weather but hope there will be a buzz around the town and let the Judges see how we enjoy the facilities that are in the town. A recent video – great introduction to the Age Friendly initiative in Skerries! 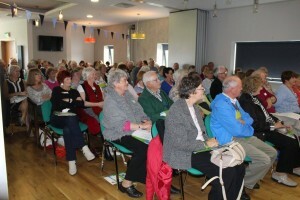 More than 170 people, many senior citizens from Skerries, attended the launch of the Skerries Age Friendly Information Pack on 30 August 2015 in the new club house of Skerries Harps GAA Club. 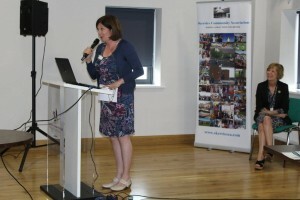 Jane Landy brings greetings from Skerries Community Association. In the background: Eithne Mallin, Fingal County Council. To learn more about Skerries Age Friendly Town Initiative, go here. This entry was posted in News by SMcK. Bookmark the permalink.